Adverb & adjective. Early 17th century. 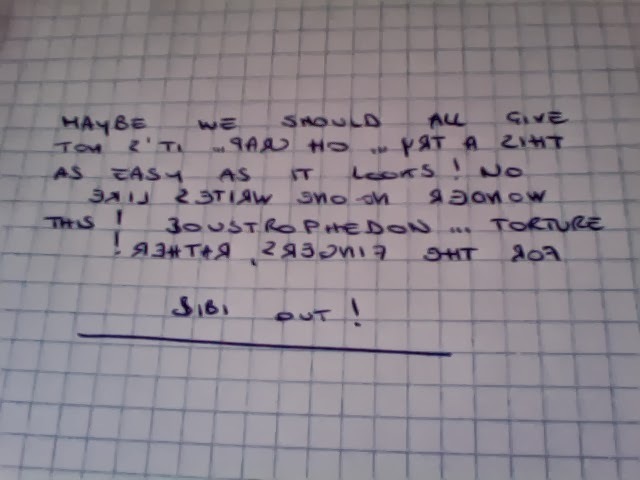 (Written) from right to left and from left to right in alternate lines. We all know that, while English is written from left to right, some languages, like Hebrew and Arabic, write from right to left, right? However, there is also boustrophedon script, most commonly seen in ancient manuscripts and inscriptions, in which the writing is bi-directional, alternating between left-to-right and right-to-left with each line. The characters are also reversed, being mirror images of their usual form. I've tried writing like this, and it's not easy, so I think I'm going to just stick with my oh-so-unadventurous left-to-right English. 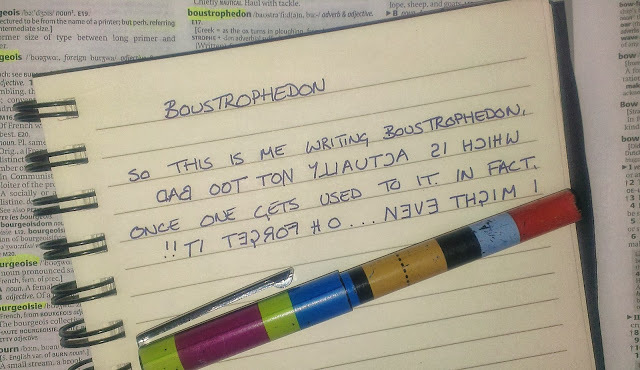 However, there are those that claim that boustrophedon script is considerably quicker to read (once one is used to it), as it means you're not constantly dragging your eyes back to the opposite side of the page at the end of each line. Just think of the time savings across a lifetime of reading - all of those wasted microseconds added up. Over the course of 70 or 80 years, it must be at least several minutes that we're just fluttering away with our eyes. That, my friends, is time that could have been spent making one more cup of tea, or checking Twitter, or mournfully looking out of the living room window and wondering where it all went wrong. All this - if only English was boustrophedon. Are you willing to sign a petition to lobby for its adoption? Do please plough your must furrowed comments below. That would give me a headache! I had a bit of a headache (and handache) after just writing that short paragraph. That's brilliant. Seriously. How eye muscle efficient is that?! That's got me all excited. So you can be 'Excited Nerd' for a day - just to mix things up a bit. In fact, you could be the first person with the newly coined 'Boustrophedonic Mood Disorder', alternating between excited and angry states daily, just through thinking about the efficiency of the human eye. That has to be a new disorder; it must be. Thank you Bibi! 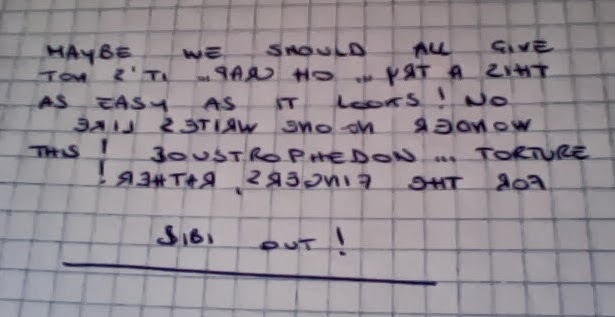 With your permission, I've added your boustrophedonic note to the post. It's hard work, isn't it! Also, if anyone else would like to submit a photo, I'd be happy to display it. Back in my boy-racer days, I new a guy who wanted to write 'Turbo' backwards in large letters on the bonnet of his Renault 5 (the model without a turbo), the idea furnished by the word 'ambulance' written backwards on the bonnets of, well, ambulances, in the UK so that when you look in the mirror to ascertain why there's a siren coming from the vehicle behind, you can conveniently read the word 'ambulance' in the mirror, confirming that it's an ambulance. I'm not explaining this well. Anyway, he wasn't the fizziest coke in the multipack, and so managed to write 'Turdo' backwards instead. I know. Look at me know ed. Sometimes I think about lexicolatry and my new friends, I have a reminiscent look at how far I've come, and I weep a little bit.